The warm bright color and warm spices of Lemon Semiya are sure to start the day with the Zing. Ingredients can be adjusted to suits everyone’s taste buds. This recipe is very easy and simple to prepare and best for morning busy time. The important aspect of South Indian cooking is, the ingredients can be adjusted according to everyone’s taste. 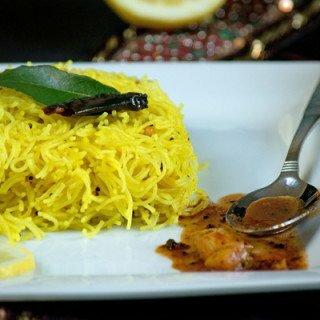 This recipe is perfect for South Indian taste buds, others please adjust accordingly. It is easy and simple to make. Unlike noodles, vermicelli are thinner and great in texture. I would say, it is in between, noodles and pasta. I love this recipe because of its evenly coated warm spiciness. Do not forget to look into other interesting recipes of ‘pepperbowl’, Vellam Poorna Kozhukkattai, Semiya Upma. Worrying about the proportion of water, no need as we are going to drain the excess water. To add extra crunchiness, add Bengal gram/Channa Dal, Roasted Peanuts, but these are optional. The warm bright color and warm spices of Lemon Semiya are sure to start the day with the Zing. Ingredients can be adjusted to suits everyone's taste buds. This recipe is very easy and simple to prepare and best for morning busy time. 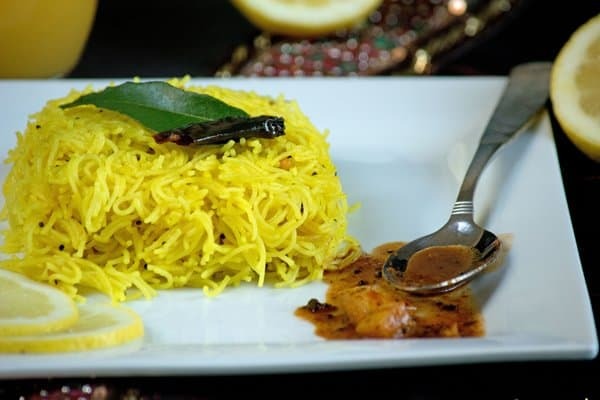 Roast vermicelli in a pan with 1 tsp of cooking oil to golden brown. Once roasted, separate it in a plate. In the same pan add 2 Cups of water, bring it to boil. Add the roasted vermicelli and cook it till 3/4th is done. Drain excess water and spread it on the plate, allow it to cool to the room temperature. Otherwise the vermicelli would become sticky. In the same pan, add 2 tbsp of cooking oil, add mustard, urad dal and wait till it gets splutter. Then add red chili, curry leaves, chopped ginger. Add the kept aside vermicelli to the pan and saute gently it for another 2-3 min in medium flame, until the seasonings were combined well with them. Serve as a breakfast or as brunch along with tomato sauce or pickles. 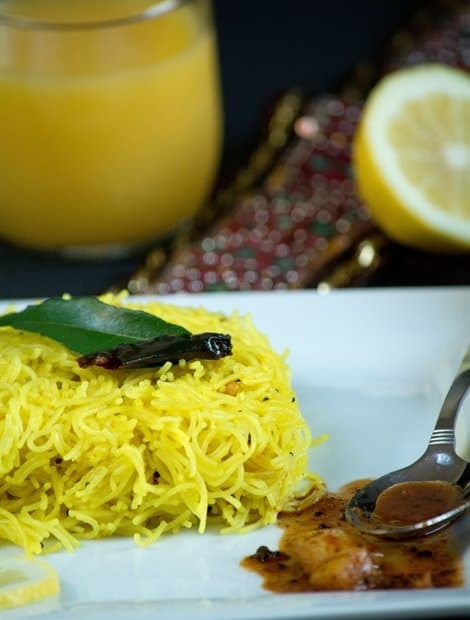 Add grated carrots, green peas for adding a color to this lemon semiya. Gud try with vermicelli. Guess what..I made pulisaadham yesterday with spaghetti !! And ur presentation is really good dear. Delicious semiya vermicelli I love the color Suja. oops..Lemon juice tends to become bitter when overcooked. So, it has to be added in the last step.